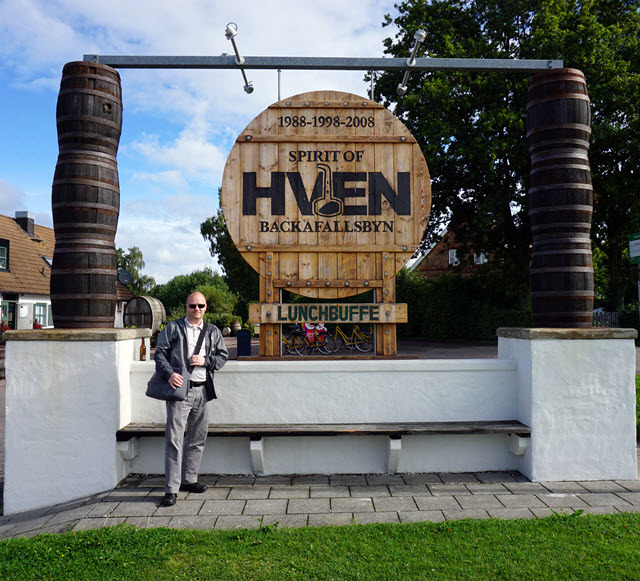 Back in September I visited the Spirit of Hven Distillery on the small island of Hven, in the middle of Øresund, between Sweden and Denmark. The island of Hven has 371 inhabitants and an area of 7.5 km2 (2.9 sq mi). The island was historically under Danish rule, and Danish astronomer Tycho Brahe (1546–1601) built two observatories here, Uraniborg and Stjerneborg. Tycho Brahe and astronomy have inspired the names of all whiskies released by Spirit of Hven so far. The transfer of the island from Denmark to Sweden was confirmed in 1660 by the Treaty of Copenhagen. In 1988 the resort Hven Backafallsbyn was established. There are a number of small cosy cottages on site where you can stay. In 1998 Anja and Henric Molin bought the resort, and slowly started expanding. They established the very impressive whisky bar on site, and built the restaurant. They also started planning the distillery. In 2008 the distillery was opened and production started. In 2009 they launched their first products; Spirit of Hven Organic Oak Matured Aqua Vitae and Organic Winter Spirit. 2010 saw the release of their Spirit of Hven Organic Summer Spirit. Then in 2012 they launched their first single malt, the Spirit of Hven Urania. Since the distillery is located on an island you have to take the boat. There are no bridges connecting it to the mainland, and it is a bit too far to swim. The easiest way to get to Spirit of Hven Distillery, from Norway at least, is to fly to Kastrup (Copenhagen Airport). Then take the train from the airport over to Landskrona in Sweden. From Landskrona you take the boat out to Hven. The boat takes about 30 minutes to cross. Once you are on the island you land at the small village Bäckviken. From here you take the local bus to Backafallsbyn where the distillery is located. The bus ride takes about 10 minutes. At the distillery gin is the main product. They also produce a lot of aqua vitae, vodka and other spirit drinks. Whisky makes up about 15 % of their sales. All production is ecological. They focus a lot on traceability in all processes, from the oak, to the barrel, to the barley (and other grain), the yeast, the maturation and each individual bottle sold. One consequence of this is that they do not use bourbon casks, as it is very hard to find any that are guaranteed ecological. They will typically sourced the oak, and have casks made to order. The fresh oak casks are then brought to the distillery where they are filled with neutral spirit, which will subsequently become their vodka and gin etc, for two years. The casks will then be emptied and filled with the new make that will mature into whisky. Henric Molin, the owner and Master Distiller is a professor type. He has an impressive laboratory set up at the distillery, and a growing part of their business is actually performing analysis and research on behalf of other companies. In production they use different types of malt (see image above), playing around with different roasting levels. They mainly use lager malt, as most distilleries do, but there is typically always two or three different types of malt in their whiskies (types of malted barley). About 5 % of the malt is malted at the distillery, and the ambition is to increase this to 100 % over time. All the barley is sourced from the local area. The water used in production is always filtered and distilled, then have the desired minerals added and pH value set. Yeast is another area which Henric pays a lot of attention to. He always uses a minimum of two yeast types in whisky production, where the second yeast type is typically added after the first 24 hours of fermentation. On occasion a third yeast type will be added after 60 hours of fermentation. All this to build a very specific flavour profile of the resulting new make. Typical fermentation at Spirit of Hven Distillery is 90-120 hours. There is always a lot of experimentation going on. They are playing around with rye, bourbon, wheated whisky and rum. In the warehouse I got a taste of an 8 YO wheated whisky that was really impressive! I do hope this will be released as a product soon. They have their own bottling plant on site as well, with a capacity of 600-1200 bottles per hour. Another area where the attention to detail comes to light, is when you hear that they will always 'wash' the bottle with the spirit they will fill the bottle with. Sort of a Richard Patterson 'washing' procedure on an industrial scale. The resort and distillery includes conference facilities with eight conference rooms, a fantastic whisky bar and a very good restaurant. I had two impressive three course dinners at the restaurant, as well as lunch and breakfast. Everything that was served was of high quality, and the price was at a reasonable level. The whisky bar will at any time hold about 500 different whiskies, as well as 30-50 different beers. It was absolutely no problem getting lost in this bar for hours on end. I enjoyed a lot of the local products, of course, but also some great whiskies from the Hanyu Card Series. Again the prices were quite reasonable. There are a total of 18 little cottages spread around a small lake at the distillery. Each cottage is split into two units, with each unit being 42 square meters with four beds. You can borrow a bicycle and go sightseeing around the island if you so please. It can be a bit windy, but it is really beautiful. Take the trip to the nearby Tycho Brahe Obervatory, or visit the very old St. Ibb church. All in all I must say that the visit to Spirit of Hven Distillery is one of my best distillery trips ever. They have the complete package with the distillery, the cottages to stay in, the restaurant and the whisky bar. I can strongly recommend taking the trip out to Hven. You will not regret it. The only thing I found slightly disappointing, was the fact that you cannot buy any of their whiskies or other alcoholic products on site. This is of course due to Swedish law, and I was expecting this. But at the same time, the distillery is on an island that is so close to 'liberal' Denmark, that you can almost reach out and touch it. Have a look here to see my reviews of the whiskies released by Spirit of Hven.